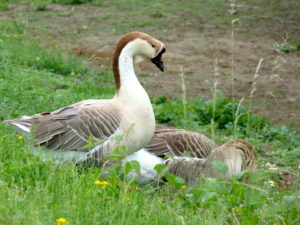 A long time ago in China there lived in Fujian Province an extroverted young bird named Grimaldi Goose. He was a keenly intelligent, exceptionally sociable gosling, equally comfortable in the air, on land, and in the water. Like all geese, he was a vociferous gabber and a voracious gobbler. Grimaldi’s elder sisters and brothers thought his name was much too difficult to pronounce in Honk, so they called him Moo Goo Gai Pan. Soon everyone in their flock followed suit. Moo Goo Gai Pan, his family, their relatives, and their many friends travelled widely. They especially enjoyed visiting a small farming village in called Luoyuan Bay. They loved to graze in the village’s rice paddies and forage in the vegetable fields. They delighted in guzzling the tasty seeds and the soft, pliant sprouts the farmers planted every Spring and every Fall. The farmers complained bitterly about that. They shrieked at the geese, rang deafening gongs, lit noxious fires, threw stones, and erected sinister scarecrows with bright, twirling metal shards to frighten them away. The geese misunderstood. They felt charmed by the farmers’ clamorous curses, which they interpreted as enthusiastic greetings. They believed the pestiferous fires were relaxing incense coils. They thought the rocks were precious treasures in the human world, generous tokens of the villagers’ affection and hospitality. The intimidating scarecrows enraptured them. 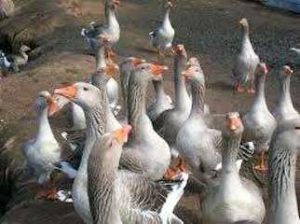 Gesundheit Goose, the flock’s somewhat senescent patriarch, agreed. The farmers’ delectable foodstuffs and their constant gestures of amity and welcome gratified the geese so deeply that they unanimously voted to forsake their nomadic heritage and settle permanently in Luoyuan Bay. None of the villagers delighted in this development, but most of them accepted it because there was nothing they could do about it. They tried. 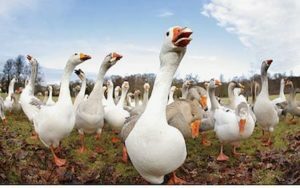 But every time they built new and more terrifying scarecrows, lit smokier fires, hurled bigger stones, and banged terrifically frightful gongs, the geese became more elated and more committed to the permanence of their residence. No matter what the villagers did to repel them, the geese persisted in supposing they were doted upon and welcomed. Only one of the farmers refused to accept the flock’s presence. He could not stand the geese. He hated them. In truth, he despised almost every person he encountered, and he detested almost all flora, fauna, and fungi. He was an unpleasant man, unreasonable, irascible, chronically contemptuous, dissatisfied, and belligerent. Even though his name was Mr. Chow, everyone in Luoyuan Bay called him Farmer Furious. Even his wife and his children called him Farmer Furious. His wife, alas, was much like her husband. Farmer Furious was wed to an impatient, inconsiderate, irritable woman beautifully named at birth Hibiscus Blossom. Her poetic name did not long endure in common usage, for as her incendiary personality intractably manifested itself everyone came to call her Farmer Fuming. This enchanting couple had two children, a tense, high-energy, easily enraged daughter the villagers called Farmer Frantic and a manically restless, curmudgeonly son they dubbed Farmer Frenzy. One steamy afternoon in June all the goslings in the gaggle were contentedly gnawing succulent stalks in the village’s principal rice paddy. As the goslings blissfully chomped and chatted, Farmer Furious, Farmer Fuming, and their charming children crept to the edge of the footpath that abutted the paddy. In each of his gnarled hands Farmer Furious grasped a dense cudgel hewn from a fallen tree limb. Farmer Fuming lugged a hefty woven basket filled to the brim with bits of bricks and dozens of rocks. Frantic and Frenzy scuttled behind them hauling a jute bag filled with long, thin, sharp thistles and barbs. The family stopped when they reached the end of the graveled track and sat side by side on a cozy ledge. Frantic and Frenzy emptied their sack and skillfully affixed tiers of thorns to the toes of their worn leather boots. When they finished preparing their weapons they elevated their raw, reedy necks, beamed at their proud parents, clenched their fingers into tight fists, and pummeled their soiled palms. The wrathful family grinned at one another lasciviously, rose as one, and glowered viciously at the obliviously grazing, cheerfully gabbling geese. Farmer Fuming reached into her basket, filled both hands with shards and stones, and pitched them one after the other at the juvenile birds. Farmer Furious ran amok into the flock lividly swinging his truncheon and roaring at the top of his lungs. Frantic and Frenzy raced behind him squealing gleefully and kicking brutishly with their spiked shoes. As was their custom, the geese misunderstood. 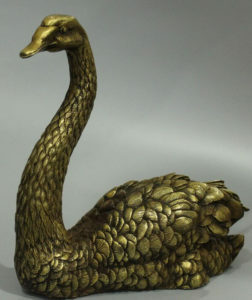 The goslings exclaimed joyfully, ran hither and yon, dodged, jumped, and flew. The adult geese cackled ecstatically and joined in the fun. They had a whale of a time as Furious swung his stick, Fuming heaved her missiles, and Frantic and Frenzy kicked their feet, and bawled obscene invectives. Despite their best efforts the incensed humans could not whack, mash, gut, thwack, smash, or stave any of the gamboling geese. Farmer Fuming collapsed with exhaustion and lay sobbing in the untidy paddy. Frantic and Frenzy fell beside her and shed voluminous tears. Farmer Furious squatted at their feet and blubbered with frustration and rage. “How sweet,” cooed their friends Galahad and Galicia. Several months passed in this delightful manner. Summer waxed and waned. The sky grew gray. The humidity eased. The temperature dropped. Just before dawn one morning late in October, a month of uncommonly stormy weather, unusual tide patterns, strong winds, livid lightening, and intense thunder, Moo Goo Gai Pan, now a strapping young gander, slipped deftly from his family’s nesting place, paddled quietly across the paddy of the Family Furious, and waddled into their lovingly tended plot of autumn vegetables. Luscious crops were unfurling their verdant foliage. Gai lan. Bok choy. Choy sum. Moo Goo quietly plucked at the plants’ blossoms and greenery. From time to time he leavened his breakfast with sips of dew beading on the leaflets, dripping from the petals, glistening in the dazzling rays of purple, crimson, and orange cast by the glorious Fujian sunrise. As he dined in the bucolic patch he listened happily to the soothing soundscape of the pond’s bustling insects, vaulting frogs, broaching eels, and plashing fish, the serene lowing of water buffalo bathing at the water’s edge, the sonorous oinks of pigs stirring on the levee, the baritone barks and mellifluous meows of the village’s wakening dogs and cats. Suddenly he lifted his beak and stood stock still in the garden. Something there was that was not quite right. His sensitive ears received a low, flat, resonant pulsation: a sense subsonic yet perceptible. His delicate webs discerned a shudder. Then a trembling. His keen nostrils detected a sulfuric scent seeping from deep beneath the threshold of the soil. The reverberation grew more noticeable. The resonance became a rumble. The tenuous aroma ballooned into an odor precise and pungent. He felt a slight shift in the sodden soil, another, then another, a lurch in the muck beneath the fine-spun membranes of his subtle feet. A feathery ripple undulated across the miniscule tips of his quills and fluttered faintly through the intricate fibers of his gossamer down. He did not fly away. Instead he raised an almighty ruckus. He stretched his pliable neck to its full height, flapped his majestic wings with turbine force, and screeched at the top of his formidable capacity. He flapped, screamed, and squalled until he roused the whole flock and all the other creatures who were slumbering in the dawn. Every goose and gosling knew what Moo Goo Gai Pan’s hullabaloo signified. They sprung from their nests, raced to his side, and joined in the alarum. All the other birds, animals, and insects understood what the geese’s earsplitting caterwaul meant. They roused themselves at once, collected their young ones, and joined in the din. They they skedaddled by hoof, wing, and fin. The geese did not skedaddle. As soon as Matriarch Gestalt saw that their friends were afoot, a-wing, and a-fin, she assembled the flock around her, divided the geese into teams, and told them to wake up the humans by any means necessary and conduct them to safety. She appointed Moo Goo Gai Pan, Gerontology, Gabardine, and Geronimo to save the Family Furious. The four friends dashed into the family’s hovel, honked like crazy, stomped their webs, and beat their wings as volubly as they could. The family stirred, yawned, groused, and groaned, but did not get up. Gerontology honked, “Right you are,” and firmly bit Fuming’s scabrous ears. Gabardine pounced on Frantic’s ankles and pricked both of her filthy, rough-skinned heels. Geronimo perched on Frenzy’s lice-infested head and chawed his broad, flat, snoring snout. As the children flailed and wailed, the earth began to shake. Only a little, at first. A trifle. Then more muscularly. Then stoutly, severely, penetratingly, protractedly. Throughout the village household commodities toppled from tabletops, counters, and shelves. Pots crashed. Crockery fractured. Glassware shattered. Booms, bangs, thumps, and thuds resounded from every corner of every hut. Farmer Furious came to his senses at last. He gathered his wife and his children into his arms and propelled them outdoors. The village square filled with fleeing families. The geese guided them across the shifting, slithering fields, steered them to the least dangerous pathways, and shepherded them to the district’s highest, safest peak. Not one life was lost. Not a single injury was suffered. As the terrified villagers quivered and quailed on the mountaintop, Farmer Furious strode to edge of the cowering crowd, bowed low three times in succession, and prostrated himself on the ground. When the earth’s shocks and shakes ceased, the villagers returned to Luoyuan Bay and set to work repairing their homes, paddies, and fields. The animals, birds, and insects came home too. In time, the village’s quiet life returned to normal. Two changes took place, however. The villagers’ Painter Laureate created a vibrant, outsized, multi-panel mural depicting the bravery of the geese and their valiant rescue of the townspeople. The Village Chairwoman wrote a communiqué on a scroll and sent it to the neighboring village. From there her dispatch spread to every hamlet, town, and city in Fujian Province. Then throughout the nation. My fellow citizens. Geese can sense earthquakes before they happen. Other animals can, too. For example, chickens & monkeys. Possibly pigs as well. To this day a great many villages in China welcome geese, chickens, monkeys, and pigs to live in peace among them. The villagers sometimes eat them, but they honor them as invaluable predictors of and protectors from seismic calamity. No villagers more earnestly have nurtured and more sincerely venerated their guardian geese than the thankful families of Luoyuan Bay. They adored Moo Goo Gai Pan, and they treasured the flock he soon became elected by acclamation to serve as Prime Minister & Sachem. Especially the Family Furious. They loved Moo Goo Gai Pan. After he married, they loved his wife, they loved their children, and they loved their entire extended family. 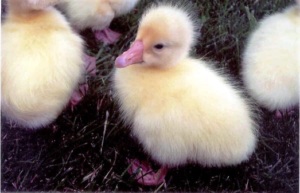 You will be pleased to know that Moo Goo Gai Pan, his beloved wife Gaia, their goslings, their grand-goslings, and, later, their great-grand-goslings loved the Family Furious right back. Some tales have a moral. Some do not.